It's well worth a stroll in the evening along the quay at the Platz der Deutschen Einheit. 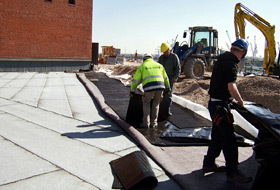 The ZinCo system build-up "Driveway with Elastodrain®" was installed bit by bit. 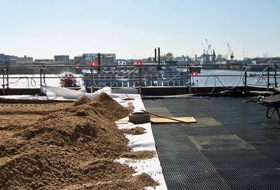 Elastrodrain® EL 202 layer is followed by the extra rigid system filter PV and then gravel and grit. An architectural wonder with a glass crown of waves: the Elbphilharmonie, affectionately known as “Elphi”, has established itself as a new landmark in the Hanseatic City of Hamburg, after much squabbling during the construction period. 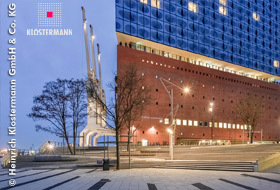 The modern glass building above the multi-storey red-brick façade of the old Kaispeicher A warehouse on the River Elbe comprises two world-class auditoriums, apartments, a hotel, restaurant facilities and a Plaza at a height of 37 m that is accessible to the public. The red-brick building houses the Kaistudios, the education centre of the Elbphilharmonie, a restaurant and the spa area of the hotel. It also contains the underground car park, which stretches beyond the facade boundaries. For this reason, approx. 4300 m² of paving were installed on the “Platz der Deutschen Einheit” with the ZinCo system build-up “Driveway with Elastodrain®”. Free access! The Elbphilharmonie is located on the western headland of the Elb island of Grasbrook in the Hamburg HafenCity. This location is marked by the former use of the Port of Hamburg. The three restored harbour cranes that have been reinstated here are some of the relics from that time. 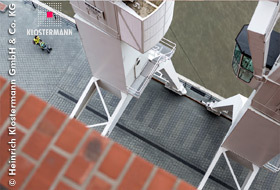 The monumental building that is the Elbphilharmonie is up to 110 m high at its western corner, comprising 29 storeys. It is enclosed from the ground floor up to the Plaza on the eight floor by the listed red-brick facade of the former Kaispeicher A. This warehouse for cocoa, tea and tobacco, built between 1963 and 1966, was fully gutted and a glass superstructure installed on in, in a true tour de force of architectural and engineering art. Swiss architects, Herzog de Meuron, sees it as an “enormous crystal that reflects the sky, the water and the city in an ever-changing way”. This is done with 1100 glass elements, some individually curved, with an applied grid foil for light and thermal protection in the building. For reasons of sound insulation, the Grand Hall and the Recital hall are completely acoustically decoupled from the rest of the building by means of steel spring packages. 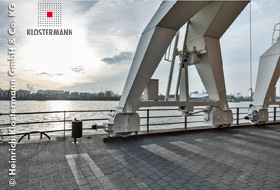 The load-distributing floor slab for the 200,000-t overall structure is founded on over 1700 piles that are rammed deeply into the Elbe riverbed. The Elbphilharmonie in the “Platz der Deutschen Einheit” is surrounded by water on three sides and is accessible for vehicles only from the eastern side. 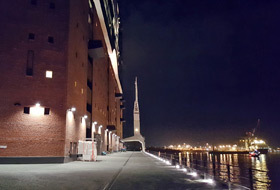 Access for vehicles, pedestrians and the ferry terminal “Elbphilharmonie” are all at this side. Visitors arriving by boat use a generously proportioned, open-design staircase to go from the jetty to the Platz der Deutschen Einheit, which stretches from the forecourt of the building through its southern side and on to the western point. This whole area is not only accessible to pedestrians but also to delivery vans that are driving to the Elbphilharmonie. As the underground garage stretches to beneath the southern access route, this (deck) surace requires not only a high load-bearing capacity but also special protection. This is exactly what the ZinCo system build-up provides with its “Driveway with Elastodrain®” across a total of 4300 m², which was installed by the Hamburg company Zum Felde GmbH. The basis was the reinforced concrete underground garage deck, with a two-percent pitch, with an infiltration-proof, bituminous composite seal. The system build-up “Driveway with Elastodrain®” was applied between October 2011 and June 2012, starting with a double-layered separation and slip layer. The separation layer is a 1000 g/m² heavy, project-specific fleece that also offers mechanical protection as it is capable of absorbing any pebbles or dirt particles that may occur. As a result, they cannot be pushed downwards into the waterproof seal. The slip function is carried out by the slip sheet TGF 20 as the second layer. The heavy-duty building protection and drainage sheet Elastodrain® EL 202 was then applied. It is made of fully vulcanised rubber and thanks to the large number of studs and its extreme stiffness (shore hardness: 75 shore A), it is the perfect substructure for heavy loads such as driveways. The continuous rebated edge and special connectors allow for the custom-fit installation of the 1 × 1 m slabs. The system filter sheet PV, a highly pressure resistant, consolidated, extra rigid filter fleece made of 100 % polypropylene was then applied. This serves to separate the drainage layer from the next layer of gravel and grit. Wheel loaders then spread the approx. 600 kg gravel per m² as, thanks to the installed Elastodrain® EL 202 elements, the roof waterproof membrane on the underground garage was well protected and was from then on accessible to heavy plant machinery. A temporary construction road was planned for the remainder of the construction works. Half of the installed interlocking 10 cm thick concrete paving stretched first of all towards the edge of the quay, directly along the south façade. This construction road was immediately accessible thanks to the edging and wood shoring. Once the second half was completed up to the edge of the quay, it was possible to use the entire area for accessing and storing construction material and for construction equipment, plant and containers. While the temporary paving showed signs of heavy-duty use during the subsequent years of the construction works, the waterproof seal remains safely protected beneath the Elastodrain® EL 202 elements. The changeover from the temporary to the final surface took place between March and September 2016. This was an organisational challenge given that other construction works continued undiminished at the Elbphilharmonie. 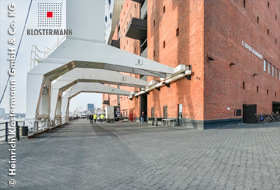 The architects of the Elbphilharmonie wished to highlight the tradition of the port in their choice of paving. For this reason, they had a new paving stone specially developed from copper slag. Copper slag pavers were used almost everywhere in the port area well into the last century. The visible surface of the 12 cm new blocks were water-blasted or sanded. This produced homogenous interlocking rows of slightly varying surfaces and shapes, with edge lengths between 20 cm and 18/20/22. These stones were installed in the area of the south façade in a visually appealing format that resembled a long “zebra crossing”. It is not only the thickness of the stones but also the layout in an interlocking pattern that will ensure that the paving will retain its shape, despite the horizontal loads that occur due to vehicles braking, turning and accelerating. 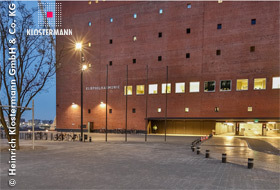 From the paved surface of the underground garage to the wave-shaped glass roof, the Elbphilharmonie is filled with special ideas that mark it out as an architectural masterpiece. 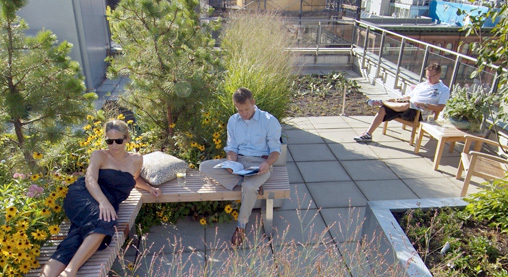 The realisation of these ideas required a high level of technical knowledge among all those involved in the project. Since the launch concert in January, the tour de force on an engineering level has now continued on a music level.